Cat's Lair is the personal web site of Richard Hartman & Antoinette Aubert, Marshall Hartman, Truffle , and Alice . 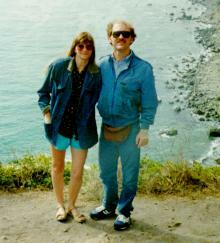 Here's a picture of the two of us (the ones without fur) somewhere on the California coast. In addition to our other interests, we appreciate the beauty and power of the great cats, especially tigers. For some cute pics of some tiger cubs born at Marine World/Africa USA a few years ago, click here. Click on the links to send e-mail to Antoinette or Richard.